A quick tutorial on how to grill up a watermelon plus a recipe for a wonderful grilled watermelon salad! 1) Cut watermelon into thick slices, about an inch thick is good. Drizzle both sides of each slice with a small amount of oil. 2) Preheat grill to high heat and place watermelon slices right on grill. Let sit for about four minutes. Don’t move the slices. 3) Flip slices once and grill on the second side for about 3 minutes. Remove from grill and let cool briefly. 4) When slightly cooled, cut watermelon off of rind and cut into 1/2 inch pieces. 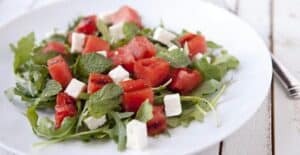 5) Lay down a bed of arugula and top with cubed watermelon, cubed feta, fresh chopped mint, a drizzle of good olive oil, and a small pinch of coarse salt. This delicious recipe was brought to you by Macheesmo. Read the full post at https://wp.me/pkSYO-9PS.